February 12, 2017 Michal B.
Countless restaurants and pubs in Prague offer traditional Czech dishes, and many of those focus mainly on serving Czech specials to tourists. You will, of course, find good and bad ones, so it is advisable to ask your hotel concierge, tour guide, or other locals for ideas on where to go. Czech cuisine has been influenced by many different cultures and their traditions during its development, and it has always been open to adopting anything new. In ancient times, the Czech cuisine was based mostly on domestic raw materials, and the basic foodstuff at that time was bread, complemented with grain legumes, porridge, and, of course, fruits and berries. 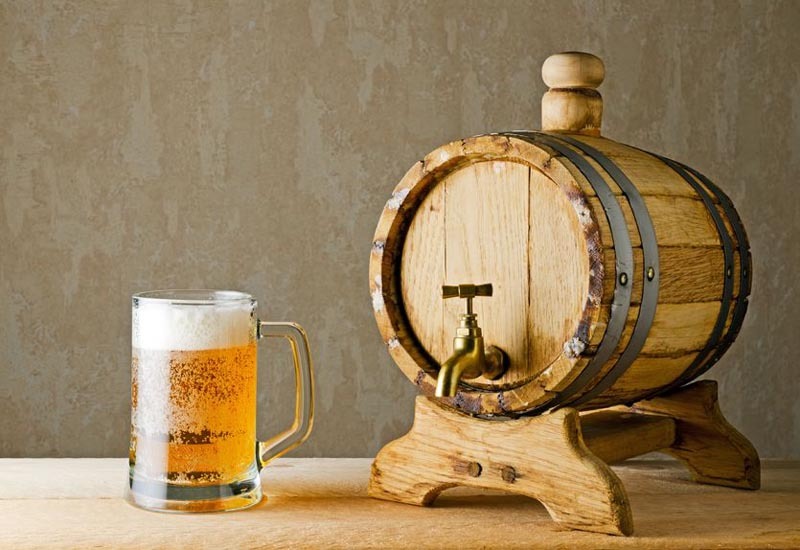 As far as beverages are concerned, apart from water (often flavoured with honey or herbs), Czech people used to drink home-cooked beer and wine in medieval times. Nowadays, the Czech cuisine mostly focuses on meals characteristic of central Europe, but with many special elements such as different kinds of dumplings, original soups and sauces, and very specific pastry. Also, potatoes are used in a number of unique ways. Some of the traditional Czech dishes are quite internationally renowned, such as marinated sirloin with special cream and vegetable sauce (“Svíčková” in Czech), roast duck with braised red cabbage, strudel or ham. The Czech cuisine is also known for its dumplings, prepared in many different ways. There are bread dumplings and potato dumplings served as a side dish, yeast dumplings and liver dumplings added to soup, and last but not least sweet yeast-based dumplings, filled with fruit. The Czechs also have their own version of goulash. Compared to the Hungarian version, it is thicker and contains no potatoes. Also, schnitzel is very popular in the Czech Republic. Czechs usually prepare it from pork and quite often the cutlet, breaded with flour, egg and bread crumbs, is fried with the bone. The Czechs often begin their meals with soup. Potato soup and garlic soup belong among the most popular ones, but there are also some quite original soups such as tripe soup, dill soup, sauerkraut soup (made of cabbage), and white soup (made of soured milk). 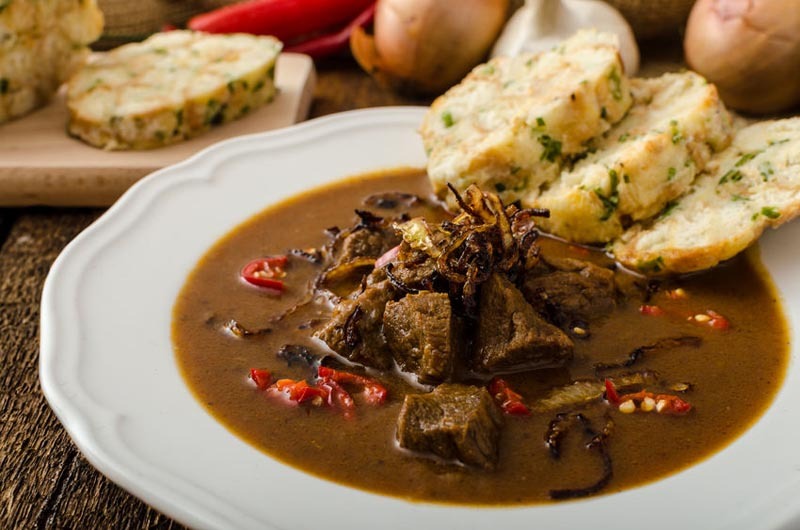 If the Czechs celebrate a wedding or other significant event, they usually have beef soup with liver dumplings. As far as desserts are concerned, you can nowadays buy a “Trdelník” (or “Trdlo”) from stalls in many parts of Prague. This delicious, long-forgotten sweet pastry is made of rolled dough, wrapped around a stick, grilled, and topped with walnut mix and sugar. However, Trdelník is not something which Czechs prepare at their homes, it’s more of a tourist favourite. 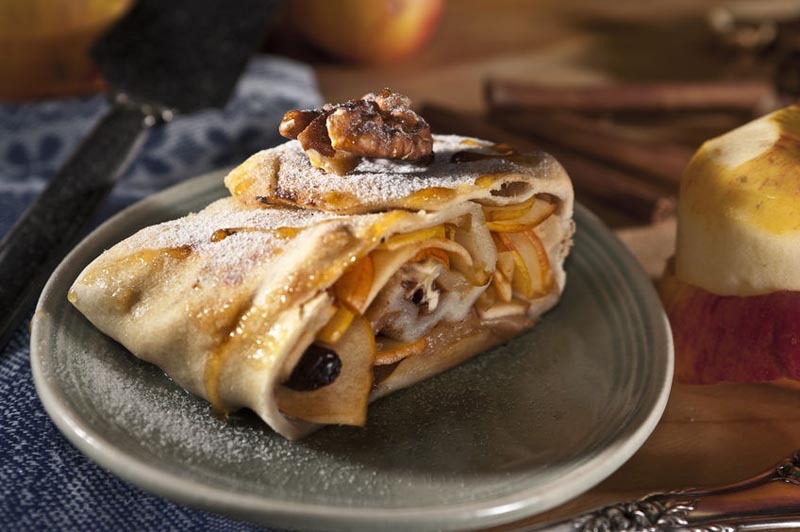 You could instead try Czech strudel (“Štrůdl” in Czech), which is an apple pie made of a phyllo pastry roll, filled with apples and nuts. Also, there is a very rich variety of traditional Czech round cakes like “Medovník“, made from honey. Every region of Bohemia and Moravia have their own special ways of topping and baking them. And let us not forget about the typical Czech beer delicacies, such as the “pickled ermine” (or “hermelín”) – a special type of cheese, very soft inside and covered in a thin white mould film), or “utopenci” (“drowned men”) – sausages pickled in vinegar, oil, onion, red pepper, and different spices. The most characteristic alcoholic beverage in Prague is, of course, the famous Czech beer. Brewing has a long history in the Czech Republic and Czech beer has been recognized as among the best in the world (the Czechs also traditionally rank high in beer consumption). Beer has been brewed in Bohemia since the end of the 1st millennium, and nowadays there are hundreds of breweries in the Czech Republic (including, of course, the very small ones, which are becoming more and more popular). The most popular and renowned beer is, nevertheless, the Czech Pilsener beer. Even though it traditionally comes from Pilsner, a city west of Prague, Pilsner Urquell is the most popular beer in the capital, followed by Gambrinus (also from the “Plzeňský Prazdroj” brewery), Staropramen (brewed in the Smíchov quarter of Prague ), Velkopopovický Kozel (brewed in Velké Popovice, a town 25 km southeast of Prague), and Budweiser Budvar (in some countries trademarked as Budějovický Budvar or Czechvar). Czechs love their beer and have a lot of lovely nicknames for it, such as “foamy liquid” (“pěnivý mok” in Czech). Beer is also called “liquid bread” in the Czech Republic, and one might say that the Czechs also consume it in that manner. On average, each Czech drinks over 100 litres of beer a year, placing the Czech Republic at the top of beer consumption global rankings. The Czech Republic is probably also the only country in the world where beer is cheaper than water (well, in some restaurants at least). Since the era of Charles IV., there is a tradition of winegrowing in the Czech Republic, especially in Moravia, the Czech Republic’s easternmost province. Czech wine is mostly produced in South Moravia; 95 % of all vineyards are located in Moravia, although there are some in Bohemia, too. The most commonly grown white grape varieties are Müller-Thurgau, Grüner Veltliner, Riesling, and Welschriesling. The black ones (from which red wine is produced) are mostly Saint Laurent and Blaufränkisch. If you have a good quality Czech red wine, it will most likely be delicious, even though we would recommend the white ones more highly. There is a traditional feast focused on wine in the Czech Republic, on the 11th of November (name-day of Martin – “St. Martin’s Day”). That is when the Czechs traditionally open and drink the young wine of the year, the first wine from the autumn harvest, for the first time. 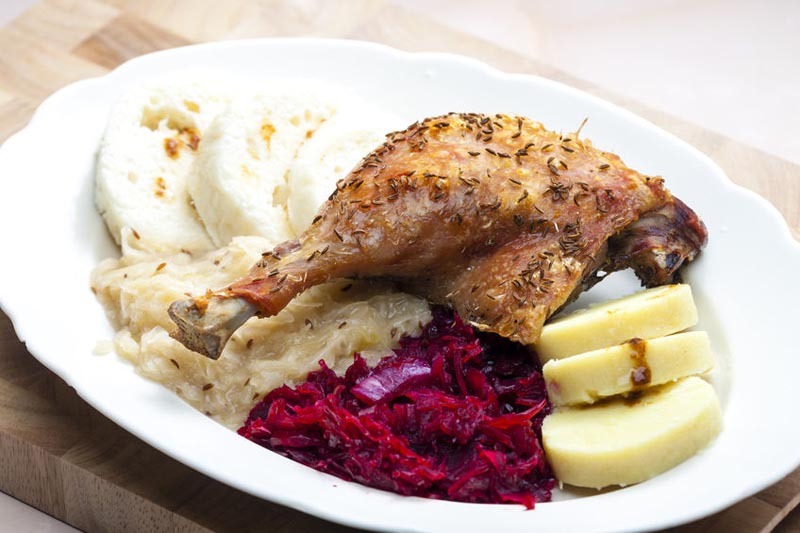 The wine is called “svatomartinské” – referring to St. Martin’s Day – and there is a traditional special feast (“Svatomartinské hody”), where the main dish is a goose with dumplings and cabbage. The Czech Republic also produces several special, traditional liquors. “Slivovice” and “Becherovka” are probably the most famous ones. The former (called Slivovitz or Slivovitsa) is a very strong fruit brandy, distilled from fermented plums. There are also other fruit liquors, distilled the same way from pears, peaches, or apricots. Czechs prefer “home-made” fruit liquors, but made by experienced and skilled distillers (mostly from Moravia), and the private-produced liquors usually contain over 50 % alcohol. The commercial, mass-produced ones are usually less “strong”, and you would probably not find a single Moravian drinking those. Luckily for Prague´s citizens, there are many originally Moravian people living in the capital – providing a “pipe-line” of Moravian liquors (and also win). Becherovka, the renowned Czech alcoholic beverage, is a herbal liquor produced in Karlovy Vary (Carlsbad). It is often drunk as a digestive aid and its top secret formula, based on a wide variety of herbs and spices, gives it an unmistakable taste. It is 100% natural, and apart from the herbs and spices it contains special Carlsbad water (supposedly with positive health effects), high quality spirit, and natural sugar. The taste of Becherovka is natural, full, and harmonic. It is drunk as a shot (ice cooled) or added to various cocktails. – everyone enjoys a concert in Prague. However some of the concerts are not as advertised. Pictures show one venue but is actually in the basement for example. – we are visiting vinohrady today hopefully to get away from the crowds. Maybe a YouTube on off the beaten path. We are not the guys from “Prague Honest Guide”, we just really like what they are doing. Like their site and drop them a message on their Facebook Page.